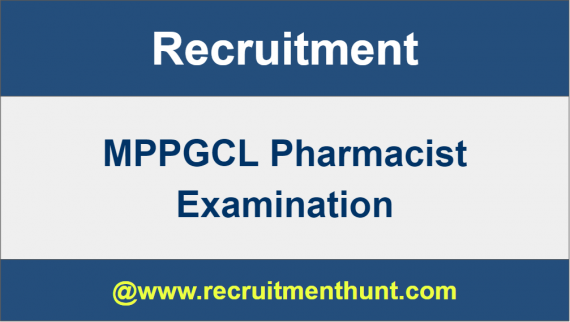 MPPGCL Pharmacist Recruitment 2019: Madhya Pradesh Power Generating Company Limited (MPPGCL) has recently announced 05(Tentative) vacancies for MPPGCL Pharmacist Recruitment 2019. Hence, all interested job seekers & aspirants can start applying online by going through all the details regarding the MPPGCL Pharmacist Post on this article. Therefore, do not miss out any updates that we provide on our page. As per the MPPGCL Recruitment Board, the starting date to submit the MPPGCL Pharmacist Online Application was 15th March 2019 & also the candidates must strictly submit the online application on or before 14th April 2019. Furthermore, applications submitted after the deadline will not be considered. MPPGCL Recruitment Board has released notifications regarding Madhya Pradesh Pharmacist Notifications & also MPPGCL Pharmacist Vacancies. We also provide latest MPPGCL Syllabus in addition to the Exam Pattern to provide proper guidance to the candidates who are working hard to secure Govt Jobs in Madhya Pradesh. Here all the important notifications such as Eligibility Criteria, Age Limit, Selection Procedure, Application Fees, etc. are available. Kindly refer to the below tables to be aware of all these details. For furthermore details/updates kindly login to the MPPGCL official website. Candidate should have passed 12th Class & must also possess Diploma/ Degree in Pharmacy. Candidates will be selected based on the rounds conducted below. Finally, after completing the selection process MPPGCL will release the merit list. The pay scale varies from Rs. 19,500 -Rs. 62,000. Step 1 – First, visit the MPPGCL official website. Step 2 – Next, go to the Option & select “Careers”. Step 3 – Read all the instructions carefully and click on “Apply Online”. Step 4 – Search for the appropriate MPPGCL notification link & click on it. Step 5 – Next, read all the details in the notification correctly & also check your eligibility for MPPGCL Jobs 2019. Step 6 – Enter the important details & upload the scanned copy of the asked documents. Step 7 – Deposit the application fees & finally, take a print out of the application form. Finally, all the candidates can check the MPPGCL Pharmacist Recruitment Notifications here. Hence, applicants can furthermore, make their preparation easier by following the MPPGCL Pharmacist Previous Years Question Paper. Therefore, download MPPGCL Pharmacist Exam Patterns in addition to the MPPGCL Pharmacist Previous Years Question Paper 2019 on this article. Also, for more State and Central Government job updates do subscribe to our site Recruitment Hunt.